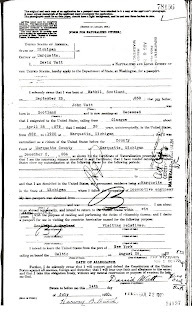 This is the first document I found when I was researching my grandfather. I was so happy, I had his name and birth date, or so I thought. I continued to research my grandfather and found out there were a couple of errors on this record. 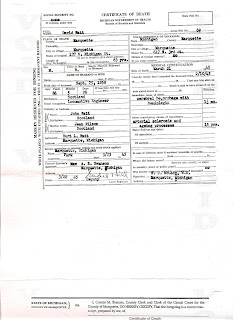 The birth record from Jackson County, Michigan states a Harry Glover was born to Frank H. Glover and Hattie L. Glover on 6 May 1883. So I ask, why did my grandfather use the name Frank Henry Jr? Was the error in the birthdate his or the recorders? 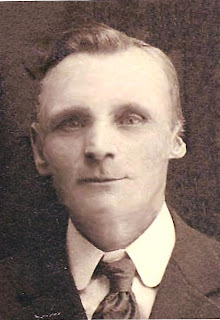 Other information on the card confirms this is indeed my grandfather, Harry Glover. It's too bad I never knew him. I can only get to know him through my dad and my research into his past. 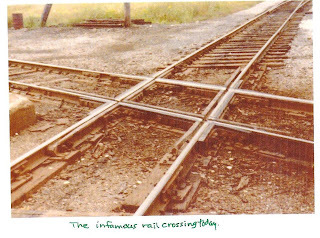 When I left off, at the last blog posting, David Watt had been urged to jump from his train engine after a train on the Soo Line failed to stop at the crossing intersecting the Duluth, South Shore & Atlantic line. David's train was hit by the other engine and David was badly injured. 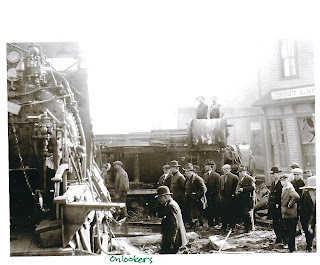 He was pinned in the overturned engine and his face and head were burned by steam and live coals from the firebox of the train. David's son, Burton, reported that his dad lay there about 20 minutes until the fireman realized that David must still be in the engine. An unknown salesman soaked his coat in water, put it over his head, and went into the engine and got David out, saving his life. The family was never able to identify the man who saved David's life. David recovered from his injuries, but lost his left ear due to the accident. 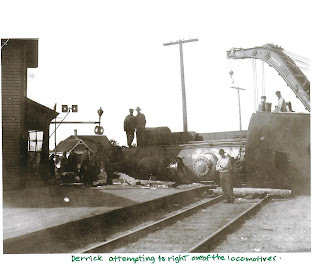 Derrick attempting to right one of the locomotives. David Watt sometime after the accident showing the loss of the left ear. 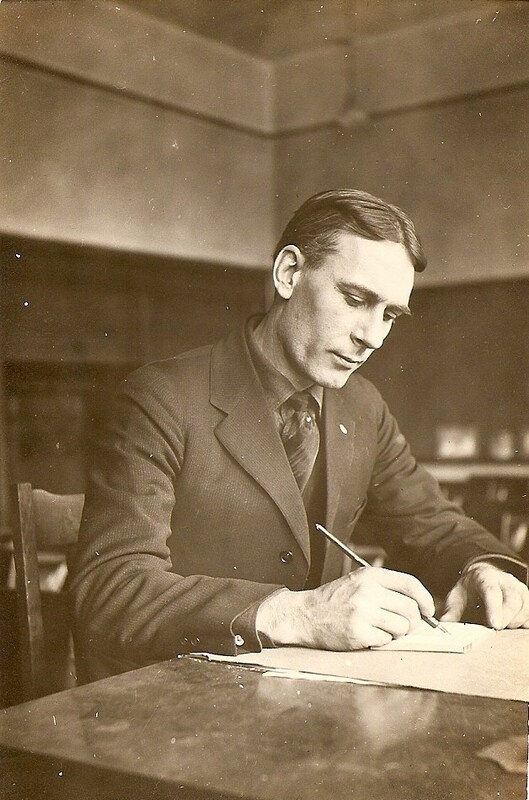 David Watt worked for the DSS&A railroad for 52 years; retiring in 1932, at the age of 74. 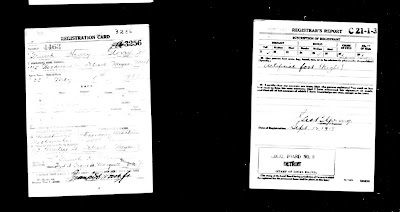 David Watt applied for a passport in 1920. He was going to Scotland to visit relatives. David's passport provides me with a lot of information. 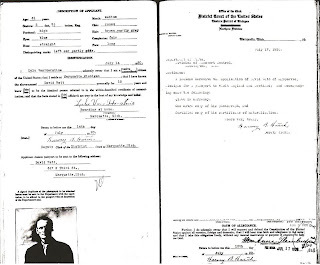 It has his birth date and place, father's name, emigration date and place, residence from 1882-1920, occupation, signature, picture, and physical description. 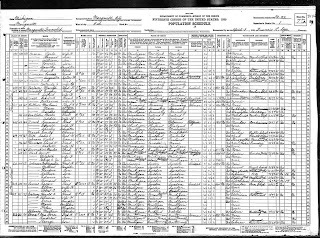 David and Katherine Watt can be found in the United States Federal Census. 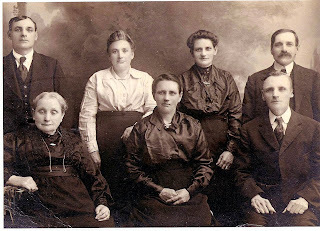 They are living in Marquette, Marquette, Michigan in 1900, 1910, 1920, and 1930 Census. When researching at the J.M Longyear Research Library in Marquette, Michigan I found this. The only information I have is what is on the picture. What is 'Members of Div. 94 at Hiawatha Beach'? 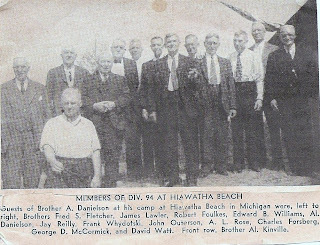 They were guests of Brother A. Danielson at his camp. 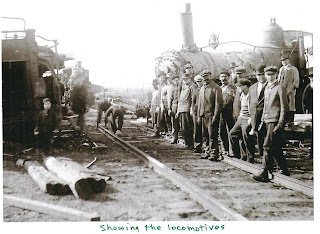 David was a member of the Brotherhood of Locomotive Engineers, could they be from this organization? I will have to do more research to find out. David Watt died 21 March 1945 in Marquette, Marquette, Michigan from a cerebral hemorrhage. He was 86 years old. David Watt is buried in the Watt Family Lot in Park Cemetery, Marquette, Marquette, Michigan. 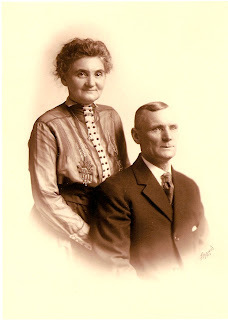 I never knew my great grandfather, David Watt. My father remembers visiting him as a child, they would travel from the Detroit area to the upper penisula every summer. This was before the Mackinac Bridge was built. I will have to write about that in the future. 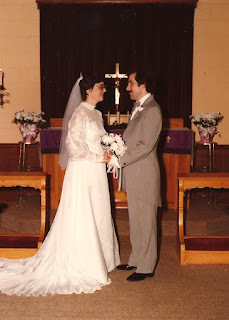 29 years ago, today, I married my husband, Kirk. 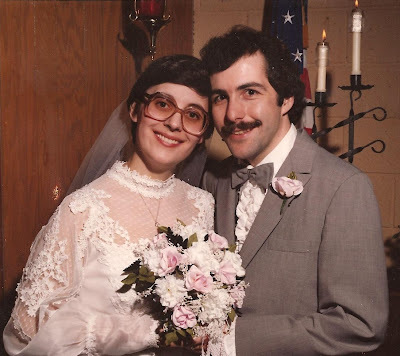 Kirk and I met in January of 1980. I had recently moved to the town my parents lived in. 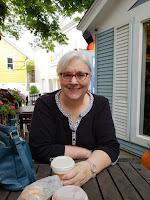 I was unable to get a job after college graduation, and decided to substitute teach. The first day of substitute teaching, I was called minutes before school started. I arrived at the school prepared to teach fifth grade. The other fifth grade teacher was told I was a new sub who had been called with very little notice. They asked this teacher if he could help the new sub out. He says he looked in the window and said sure! The other fifth grade teacher was Kirk. We started dating shortly after that and 14 months later we married. The surname Watt originated in England or Scotland. The earliest recording of the surname in Scotland was in 1586. It has been found written as Watt and Wat. 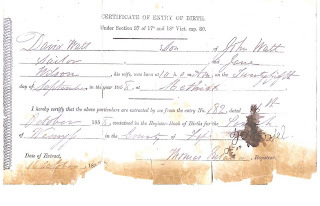 The Watt side of my family set sail from Glasglow, Scotland in April of 1879. David Watt was born 25 September 1858 in Methil, Fife, Scotland and died 21 March 1945, Marquette, Marquette, Michigan, United States. 1. Allen County Public Library, Fort Wayne, Indiana: My favorite library to go to. The genealogy center is huge. An added bonus is the cafe on the first floor and a wonderful staff to help you. 2. Manistee County Historical Museum, Manistee, Michigan: The surname card catalog is worth the trip alone. The staff is very friendly and helpful. 3. J.M. Longyear Research Library, Marquette, Michigan: They have a biographical card file, Chase Interviews-Interviews of over 350 Marquette county pioneers, Mining Journal newspaper issues on microfilm and much more. Rosemary was very friendly and helpful. 4. Vermont Cemetery, Chelsea, Michigan. This little cemetery located at the corner of Jerusalem and Chelsea-Manchester/M-52 Roads has an engraved stone honoring the pioneers who came from Vermont in 1832 and settled in area. 5. Helen Warner Branch of Willard Library, Battle Creek, Michigan: For a small branch they have a surprisingly decent selection of materials. They have some Michigan county histories which have been helpful and great Colonial Ancestry resources. Plus, it is just minutes from my home. The Fredrick name is German in origin. It comes from "Frid" or "Fred" for peace and "ric" for power. Other spellings include Freidrich and Frederick. 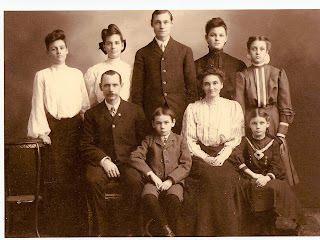 The Fredrick side of my family arrived in the United States in the early 1870's coming from Prussia, Germany. 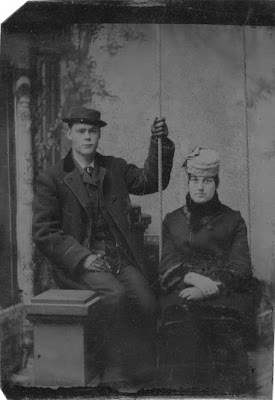 My great grandfather, Johann August Fredrick was born 8 January 1845 in Prussia, Germany. He died 27 Jan 1924 in Manistee, Manistee, Michigan. 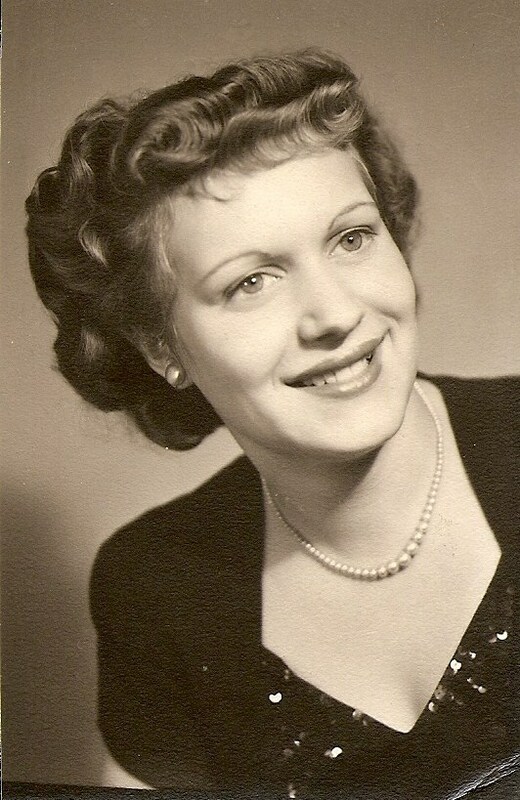 Today is my mother's 80th birthday. 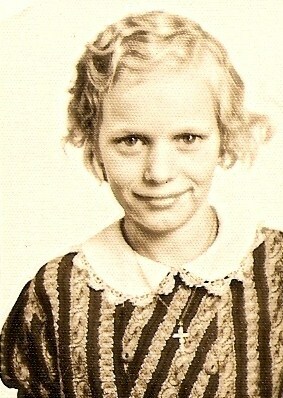 Happy Birthday, Mom! I am blessed to still have my mother in my life. Here is a photo tribute to my mother on her special day. Anyone who is into genealogy has probably spent hours searching cemeteries for an ancestor's gravestone. I thought I was being so organized by researching the cemetery and contacting the sexton before I left home. I had information on the grave sites of David and Katherine Watt and Frank and Hattie Glover, my great grandparents. Plus, I wanted to find my grandfather's grave, Harry Glover. The sexton was very helpful and had the information ready when I got there. He mapped out where to find them; the first four in the same area. He said that Harry Glover was not buried in Park Cemetery, Marquette, Michigan. My father, who was with me, was sure his father was buried there. Off we went to find the four we knew were there. We found David and Katherine Watt first. There were other Watt's buried nearby, many who my father had known. I took pictures and went on my way to find Frank and Hattie. My husband, Kirk, was walking along a row and said here is a Glover. I was intent on reaching my next destination, but I walked back and said "Harry Glover-that's my grandfather!" So, Harry Glover was buried in Park Cemetery. More pictures were taken and we moved on to Frank and Hattie's grave, which was very close to their son Harry's grave. I guess the message from this visit is don't be too intent on only going to the graves you seek; take time to check the surrounding area. Who knows who you might discover? Daniel Fenn has been a source of frustration for a few genealogists. I have seen message board posts that confirm this. 1. Who are Daniel Fenn's parents? 2. Why can't I find the death record for Daniel C. Fenn? 3. Is Daniel C. Fenn buried in Vermont Cemetery, Chelsea, Washtenaw, Michigan? There is quite a bit of information on Huldah Rowley's family, but very little on Daniel Fenn's. What do you think, any suggestions for further research sources? Seeing this picture made me wonder when white became the traditional color of wedding dresses. The history of the white wedding dress can be traced to Queen Victoria in 1840. 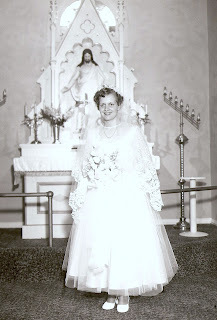 She was married in a white wedding dress. During the industrial revolution department stores started opening. A white wedding dress was available to more brides. By the 1890's it began gaining in popularity. and not all brides choose white. What color was your wedding dress? 1. When shooting gravestones flat to the ground, stand directly over the stone. Make sure your shadow doesn't cover the stone by shooting in full sun or full shade. The ideal time of day to take photographs outdoors is in the early afternoon when the sun is not at its highest point. 2. To shoot vertical, upright gravestones, get down on the ground and make sure you are eye to eye with the stone. Again, make sure your shadow isn't in the way. You can angle your body off to the side a bit if you need to. 3. Need to shoot a mausoleum or large tomb? Shoot from a corner angle so you can see the depth and scale of the building. When you shoot straight on, directly from the front, the building will look two dimensional. 4. If you are shooting close up details or text, try not to use a flash if the stone is shiny. It's better to move back a few steps and zoom in rather than putting the camera right up to what you're taking a photo of, this allows the lens to focus. 5. As always, be repectful and quiet. There could be greiving families nearby, so don't use a lot of equipment. A tripod isn't necessary. Kirsten is the daughter of Brenda, a budding social media maven and is married to photojournalist Chase Agnello-Dean. Have you ever looked through yellow and brittle newspapers? Genealogists never know what kind of conditions they will be subjected to when researching old records. One trip my husband and I took, in June 2009, was to the Manistee County Historical Museum in Manistee, Michigan. 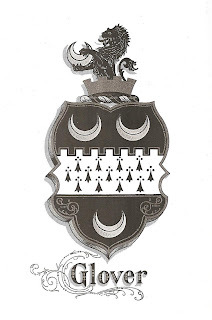 I had recently found out that both my mother and father’s families had ties to Manistee County. The Manistee museum has a huge index card catalog sorted by surname. Surname references may be from newspaper articles, which they site on the card. I could hardly wait to look for my surnames (Fredrick, Graf, and Glover) in the card catalog. In addition to the card catalog, they have stacks of newspapers in the county going back to the 1870’s. What a find! I found birth announcements, marriage announcements, obituaries, and even an article on a Fredrick family reunion in 1922. Although it was a dirty and dusty task to find the articles (they actually let you look through the original newspaper) it was a marvelous resource that added to my family history records.